RetroChallenge board almost working! | What's All This Brouhaha? ← PC boards for RC2017/10 are here! Not everything is installed, but the power supply, data hex LEDs, most of the switches, and the composite video output are working. 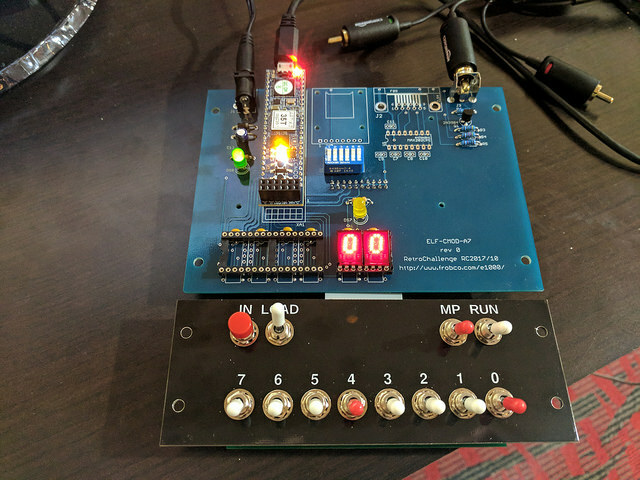 The switch for data bit 3 doesn’t work because I wired it to an analog input pin of the Cmod-A7 module, and the FPGA internal pullup isn’t enough when the switch is on (open) to overcome the 2.4K series resistance on the module and bring the signal up to a logic 1.